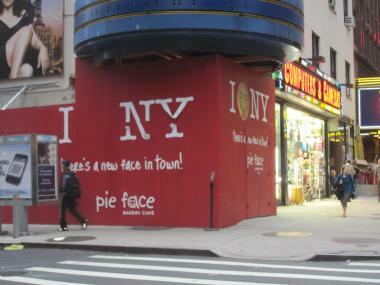 The new Pie Face location on Broadway at the corner of West 53rd. MIDTOWN — Meat pie lovers are making sad faces. 'Pie Face,' the Australian bakery about to make its debut in New York, has pushed back its first outpost's opening date due to construction delays. A company spokeswoman confirmed that construction has been slower than expected, forcing the shop to wait until Dec. 30th to open its doors next to the iconic Ed Sullivan Theater on Broadway and West 53rd Street. The shop, which was slated to open this week, will specialize in sweet and savory meat pies filled with a "delicious, rich kind of thick stew encased in a buttery pastry" decorated with different playful facial expressions. Flavors will include chunky steak, chicken and mushroom, pork and apple, tandoori vegetable, and bacon, egg and cheese. The block will also soon be home to the city's first Steak ‘n Shake, the beloved Midwestern burger chain, which is now scheduled to open Jan. 12, a spokeswoman said.